Waves and volcanoes on the wonderful island of Lanzarote, the northernmost of the Canary archipelago. The perfect description of surfing in Famara. A spot of incredible sunsets and constant waves make us give this island an article focusing on its jewel in the crown “Famara beach”. surfing in Famara is an unforgettable experience. Famara along with the Quemao, are the two most famous beaches for surfing in Lanzarote. Famara with its white sand beach about 6 km long and the island of La Graciosa in front. This is what gives it unparalleled scenic beauty. Surrounded by dunes and mountains, the landscape of Lanzarote will surely catch you. Its rock bottom is undoubtedly another good reason to spend a getaway to this beach. 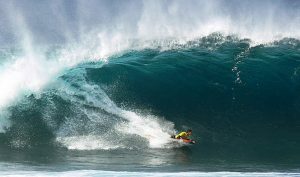 It has several peaks, some also with a sandy bottom, for the enjoyment of all levels of surfing. You can find numerous surfing schools and the possibility to rent the equipment if you wish. There is a fantastic surfing environment along the whole beach and surroundings. The 6 km of Famara beach is divided into several spots, both left and right, but usually, they are fast waves and fun, manoeuvrable pipes. √ left of San Juan, rock bottom, long and occasional tubes, which has been chosen for some tests by the ASP. It is the best-known spot I could say of the island. √ the Cagao, wave also of fast and fun rock, short but for all levels of surfing. √ the Famara Pier, a wave of quality, with left and right and rock bottom. It is a fantastic option when a lot of sea comes in. √ the rest of Famara beach is already mixed rock-sand or sand bottom, which is ideal for less experienced surfers. or El Molino, a spot chosen by the schools for a first initiation to surfing. Do you want to make a surf visit to Famara? Casa Caleta@Famara… the perfect spot to start to discover why they call it the European Hawaii! If you’re interested in diving in Lanzarote, here’s some interesting news!